It’s rare for me to do digital art – I need to do it more in the new year, honestly. It’s been a while since I’ve posted a W.I.P onto here! Here, I’m just using some Cason XL Marker paper to colour over a drawing in my sketchbook that I ruined by using a certain brand of markers on it (I didn’t know it would tear up the paper, sadly!). Gotta love making mistakes, yeah? Work In Progress – Wow, this is different. Recently – like, just yesterday of posting this – I got a Yiynova MSP19U+. It’s an interesting change from a tablet tablet to a screen tablet. Can’t wait to make wonderful-arse things with it. Work In Progress – I just pop’d my shoulder in place. That’s all. That’s the only reason I’m posting this. At times, I need to draw my OCs in clothing they would never wear. 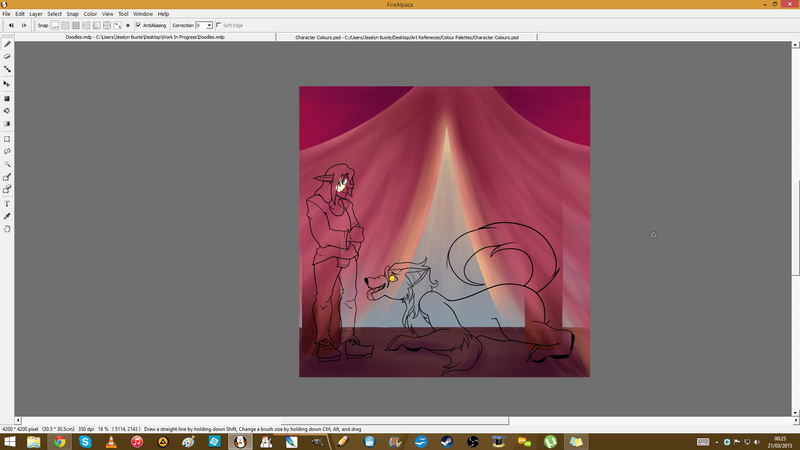 Work In Progress – Ohwow, FireAlpaca is cool. Work In Progress – Lookit the dog…Human…Thing. At times, you need to doodle your own characters being silly, adorable, or…Just a dog. To be honest; the title is not permanent. I have no idea what to call this other than ‘Game Of Cows’ or ‘Game of…? ?’, so I went with the one that makes the most sense to me. This is honestly just supposed to be a doodle in the end of the day – if it gets be on that point, chances are I’ll use my inks and water colours to make work. At times, all I can draw is mine and my friend’s characters meeting up – even if they could never possibly meet up in their own ‘canon’. Just posting a quick WIP shot of a really belated birthday gift. I promised myself that this year I’d make all of my friend’s B-Day gifts early, yet here I am.